[Now over] You're invited to Airhead's Puffle Digging Expedition! Hey everybody! The time to find golden items is here! I was trying to find items on Club Penguin but it wasn't much fun because I was doing it alone so I thought why not go puffle digging with friends? 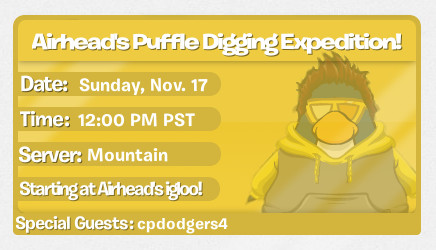 Join me and cpdodgers4 on a puffle digging expedition on Sunday, November 17th! Everyone is invited! If you're a member make sure to bring your gold puffles....OH and wear a lot of gold! If you're not a member then be sure to bring your red/blue puffle, wear yellow and find items with us! Update: If you wear enough GOLD/YELLOW then your penguin will get its picture taken and put on this blog for everyone to see! Basically what we're going to be doing is walking around the island trying to find cool items or coins! We're all going to meet up at my igloo first then start our expedition at the beach! All of the party details are in the invitation above! I hope to see you all there! I know we're going to have a blast!